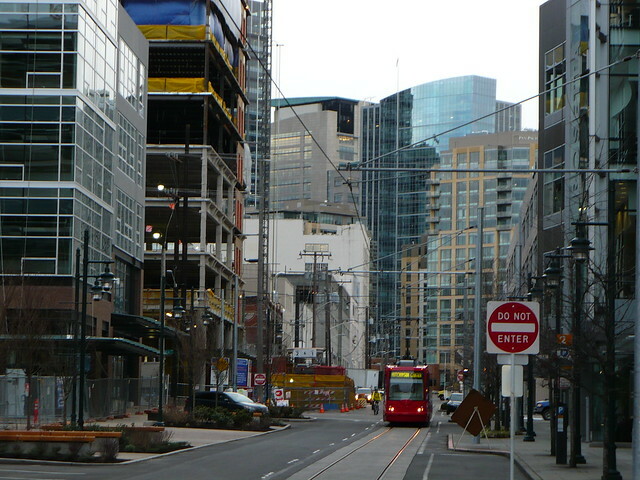 Terry Avenue in South Lake Union. Attributed to Transit Nerds. Transit could be a lot better: At Seattle Transit Blog, your columnist proposes big changes to Metro’s South King County network, with Link playing a key role in the plan. The Rainier Valley advocates for a new Link Light Rail stop at Graham Street. Perception of good design for transit facilities may matter just as much as service itself in attracting ridership. Or it could be a lot worse: Bus cuts are the antithesis to all the above. The number of pink mustaches is too damn high: The Seattle City Council voted to legalize transportation network companies (TNCs, also known as “ride-sharing”). The bill will establish unified licensing and training procedure for the city’s various car-hiring services. More controversially, each TNC will be limited to 150 active drivers at a given time. Like any good compromise, no one is happy with the result. Take a walk on the supply side: A Canadian company will deliver 1,945 housing units, in close proximity to Amazon’s new campus. As Dan Bertolet argues, this is cause for celebration, not anger. Separate and unequal: Inequality is rising throughout the country, and especially in our cities. Interestingly, some cities are unequal because the rich are really rich, while other cities are unequal because the poor are really poor. Not that either one is a great place to be. Urban adventurer: John Feit takes us on a wonderful tour of West Capitol Hill’s urban alleys. But will the roasters earn $15/hour? Starbucks plans to build a specialty roasting facility on Capitol Hill. Carmageddon, take 20: Basically every highway in Seattle is closed this weekend. Our prediction: nothing bad will happen, proving once again that transportation patterns are not set in stone. It turns out that some people actually drive in Manhattan: New York City is considering a plan that would implement roadway pricing for Manhattan’s most congested streets and bridges. If you’re going to implement roadway pricing, then a borough where fewer than 25% of residents own cars seems like a good place to start. It’s really happening: Over at Ravenna Blog, Rebecca has posted a beautiful photo series of North Link construction activity at Roosevelt Station and the Maple Leaf Portal.